Viewers watching Ireland’s Euros qualifier against Gibraltar this afternoon were treated to a very rare sighting, a plane took off as the match was being played. 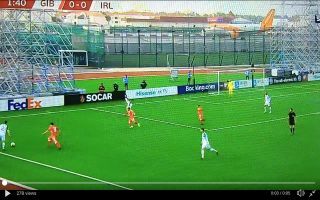 Less than two minutes into Ireland’s clash against minnows Gibraltar an easyJet flight was seen taking off right next to the stadium. It seems that the stadium that the match is being played at is right next to an airport. Ireland fans will be hoping that the team seeing an easyJet flight next to them, will make them feel right at home, Mick McCarthy’s side should be coming away from this match with a comfortable victory otherwise questions will be asked. This might be the only match in history that will satisfy both football fans and avid plane spotters.